for RealAudio comments by the composer, 4:17. Jarrad Powell is a composer whose work involves a variety of media, including chamber music, music for theater and dance, and sound installation. He has an interest in the music of Asia, and is especially noted for his work with gamelan. He was born in Montana in 1948 and studied music from an early age, including piano, percussion, and guitar. He received his M.A. in music composition from Mills College, where he studied with Anthony Braxton, Conlon Nancarrow, David Rosenboom, Pauline Oliveros and Larry Polansky and received the prestigious Paul M. Henry Award for excellence in music composition. 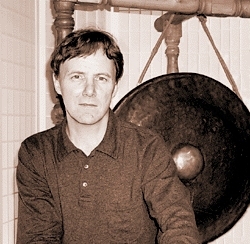 He has also studied Javanese gamelan extensively with a number of teachers, including K.R.T. Wasitodiningrat, Endo Suando, Antonius Sutrisna, Supardi, and Sri Djoko Rahardja. Mr. Powell has been a faculty member at Cornish College of the Arts since 1987, where he is currently Associate Professor. He is also Director of Gamelan Pacifica, Artistic Director of the Seattle Creative Orchestra, and co-director of Composer/Choreographer: new dialogues dance, music, media. He has recorded for What Next? Recordings, Periplus, Mode Records, New Albion, O.O. Discs, and the Leonardo Music Journal. 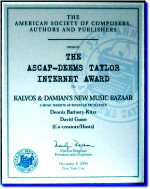 Awards include Artist Trust Fellowship (1999), Creative Capital Foundation (1999), King County Arts Commission Special Projects (1999), NEA Commissioning and Presenting (1998), Rockefeller Foundation Multi- Arts Production Fund (1997), NEA Commissioning and Presenting (1997), Seattle Arts Commission Individual Artist Award (1995), Meet the Composer (1994), Seattle Arts Commission Diverse Works Progam (1993), Meet the Composer (1993), Arts International INROADS Program (1993), Arts International Travel Grant (1992), Meet the Composer (1986), Seattle Arts Commission Individual Artist Award (1985). Commissions have included Zeitgeist/Music in Motion (1996), Consortium commission from On the Boards, Walker Art Center, and Performing Arts Chicago (1994), Southeastern Center for Contemporary Art (1993), and New Songs (1990).